The Entry Level Sales Associate Resume Template acts as a resume framework to relieve those wishing to embark upon this career or expand their experience. The first step to achieve this will be to develop a good resume to convey some vital information. When a recruiter receives this document they will want to know your contact information, your experience, and what you bring to the table. Obviously, applicants in this position want to make the best impression imaginable and this is the purpose of a resume: to introduce a job applicant to a hiring entity. 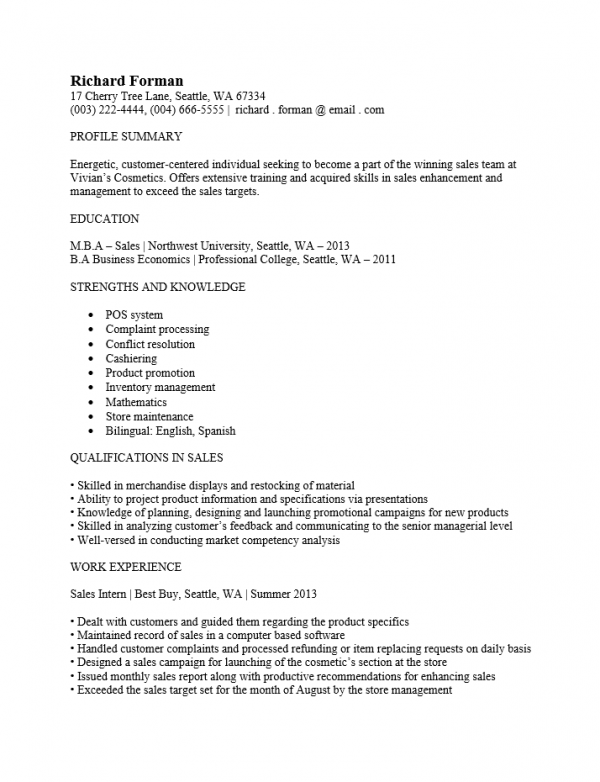 A resume template will have the formatting and headings necessary for a polished looking resume already built in. A user merely needs to fill out the sections as carefully and accurately as possible. It is often a good idea to assume that a significant amount of time will be required and of course make sure to use up-to-date buzzwords. If there is a specific job one wishes to apply for be familiar with the requirements written in the ad and attempt to address them. With the proper motivation, language, and good resume template, an applicant with little to know experience can level the playing field when seeking an interview. Step 1. The top part of the page should contain your name and contact information in a standard font. Except for your name, the style and size should match the rest of your resume. Your name should be very noticeable. Try enlarging it or bolding it but make sure to keep it professional looking. Step 2. Under “Profile Summary,” deliver one or two statements regarding your professional identity and how you expect to contribute to the positon. Keep these brief and smartly written. Step 3. List your academic credentials in the “Education” section. Give the official title of any degree you may have, the name and location of the school you attended, and the graduation year. Step 4. In the “Strengths and Knowledge” section give a list that relates to the job of your skill set and knowledge base. Everything in this section should be applicable to the position you are applying to. Step 5. In the “Qualifications in Sales” section, make a list of anything you are particularly proficient in that would contribute to achieving a sales quota the potential employer may expect. Step 6. The “Work Experience” section is more or less a history of your previous positions. These could be actual jobs or volunteer work. Give the official title you held, the name of the company you worked for, its location, and the date range you were there for. Include a list of your duties or responsibilities below this. If you have more than one entry, list them in reverse chronological order. Step 7. In the “Computer” section, list the software you are proficient in. Some employers will truly expect a certain base in this so be thorough and accurate. Step 8. If you have any particularly useful skills in communication or handling people, list them in the “Interpersonal” section.